Earth’s magnetic field has been getting weaker, leading some scientists to think that it might be about to flip, but the field may simply be coming down from an abnormally high intensity rather than approaching a reversal, scientists write in a new paper published online this week in the Proceedings of the National Academy of Sciences. Humans have lived through dips in the magnetic field’s intensity before, and there are debates about whether reversals had any connection to species extinctions in the past. However, we have something else today that would be affected by a significantly weakened magnetic field: technology. The magnetic field deflects the solar wind and cosmic rays. When the field is weaker, more radiation gets through, which can disrupt power grids and satellite communications. For the study, the scientists used a new technique to measure changes in the magnetic field’s strength in the past and found that its long-term average intensity over the past 5 million years was only about 60 percent of the field’s strength today, much weaker than the global database of paleointensity suggests. The findings raise questions both about claims that the magnetic field may be nearing a reversal and about the database. “The field may be decreasing rapidly, but we’re not yet down to the long-term average. In 100 years, the field may even go back the other direction,” said Dennis Kent, an expert in paleomagnetism at Columbia University’s Lamont-Doherty Earth Observatory and co-author of the study with his former student, Huapei Wang, now a post-doctoral research associate at MIT, and Pierre Rochette of Aix-Marseille Université. The study’s results fit expectations that the magnetic field’s intensity at the poles should be twice its intensity at the equator. In contrast, the time-averaged intensity calculated from the PINT paleointensity database doesn’t meet the two-to-one, poles-to-equator dipole hypothesis, and the database calculation also suggests that the long-term average intensity over the past 5 million years is similar to the field’s intensity today, the authors say. The authors believe the difference is in how the samples are analyzed. They say the database, which catalogs paleointensity data from published papers, includes a variety of methods and doesn’t clearly delineate data from two different types of magnetized mineral samples, tiny single-domain grains that come from sites that cooled quickly, like basalt glass on the outer edges of lava flows, and more commonly sampled larger multi-domain grains found deeper inside lava whose magnetic behavior is more complex and requires a different type of analysis. Going forward, paleointensity databases could confront the problem by explicitly describing the domain state of the samples, Kent said. The Earth’s magnetic poles have fully reversed several hundred times over the past 100 million years, most recently about 780,000 years ago. Some scientists believe a dip in the magnetic field’s intensity 41,000 years ago was also a brief reversal. When scientists recently began noticing a decline in the magnetic field – about 10 percent over the past two centuries – it led to speculation that another reversal could be coming. That doesn’t mean it would happen quickly, if it happens at all. The magnetic field’s intensity rises and dips without a clear pattern, only sometimes dipping far enough to become unstable and possibly reverse. During a reversal, geomagnetic intensity declines during a transition period that typically lasts hundreds to thousands of years, then rebuilds. For the new study, the scientists used ancient lava flows from sites near the equator and compared the paleointensity data with from lavas collected near the South Pole. As lava cools, iron-bearing minerals form inside and act like tiny magnets, aligning with the Earth’s magnetic field. Scientists can analyze ancient lava to determine both the direction and the intensity of the magnetic field at the time the lava formed. The scientists used a new technique for analyzing multi-domain samples. They worked with a representative range from the past 5 million years using 27 lavas from the Galápagos Islands, about 1 degree of latitude from the equator. The results were then compared to those from 38 lavas with single-domain properties from a volcanic area near McMurdo Station in Antarctica, about 12 degree of latitude from the South Pole. Averaging the geomagnetic intensity of each set revealed close to a two-to-one intensity difference between the polar site and the equatorial site, fitting the geocentric axial dipole (GAD) hypothesis, which most paleogeographic reconstructions rely on. The results show that the time-averaged geomagnetic field intensity over the past 5 million years is about 60 percent of the field’s intensity today and aligns with the GAD hypothesis, both in direction and intensity. Other studies using only single-domain basalt glass from the ocean floor have found a similar time-averaged intensity, but they did not have samples to test the polar-to-equator ratio. The agreement helps to validate the new multiple-domain analysis technique, Kent said. The lower time-averaged paleointensity also suggests a shorter average magnetopause standoff distance at which the Earth’s magnetic field repels the solar wind, about 9 times the Earth’s radius compared to nearly 11 times the Earth’s radius today, according to the paper. 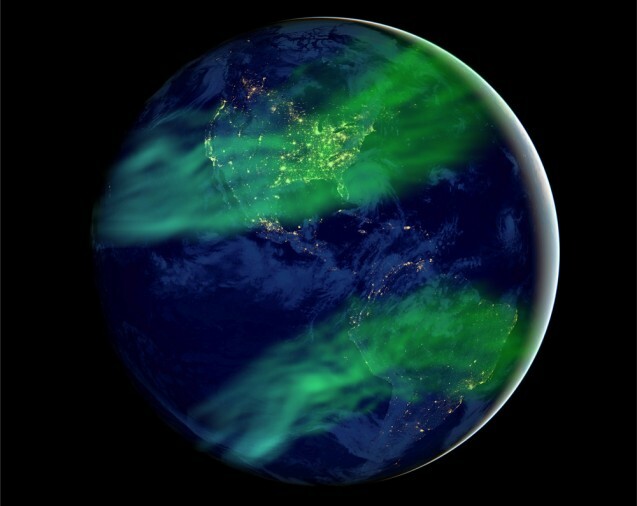 A shorter standoff distance results in stronger radiation at Earth’s surface and in the atmosphere, causing more frequent low-latitude auroras.